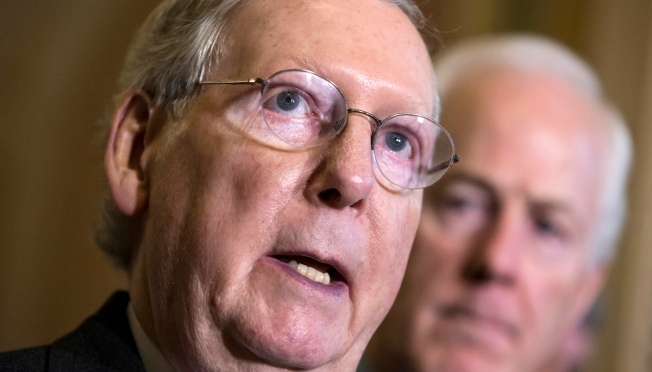 In this Dec. 1, 2015, photo, Senate Majority Leader Mitch McConnell of Ky., joined by Senate Majority Whip John Cornyn of Texas, tells reporters that he’s confident he will have enough support on an effort to repeal the Affordable Care Act this week during a news conference following a GOP policy meeting on Capitol Hill in Washington. Republicans drove legislation toward Senate approval Thursday that would demolish President Barack Obama's signature health care law and block Planned Parenthood's federal money, edging toward a veto fight the GOP knows it will lose but believes will delight conservative voters in next year's elections. "It's defined by failure," Senate Majority Leader Mitch McConnell, R-Ky., said of the law, blaming it for rising medical costs and citing problems encountered by Kentuckians. "It's punctuated with hopelessness. And the scale of its many broken promises is matched only by the scale of its defenders' rigid and unfeeling responses to them." Senate Minority Leader Harry Reid, D-Nev., mocked the Republicans' "absurd attempt" to repeal the health care law and noted the large number of people — including in McConnell's Kentucky — who've obtained coverage under the law. In one, the Senate voted 54-46 to reject an attempt by Democrats to prevent the cuts to Planned Parenthood. The proposal by Sen. Patty Murray, D-Wash., which came six days after a gunman killed three people at one of the group's Colorado clinics, would have also provided $1 billion for safety at women's clinics. Republicans fault the health care law for rising insurance premiums and deductibles and a diminished choice of insurers in some markets. Government officials said this week that health care spending grew last year at 5.3 percent, in part because of the health law's coverage expansion, the steepest climb since Obama took office. With GOP leaders insisting they had the votes they would need, Sen. Mike Lee, R-Utah, said he would support the bill, saying it "lays the groundwork for Obamacare to be erased from the books altogether." He and two GOP presidential candidates, Sens. Marco Rubio of Florida and Ted Cruz of Texas, threatened in October to oppose the legislation if it didn't go further than a similar House-passed version. GOP lawmakers suggested the bill could serve as a bridge to a new Republican health care law. Though Obama's overhaul was enacted five years ago and gets tepid support in public opinion polls, GOP members of Congress have yet to produce a detailed proposal to replace it. Democrats say repeal would destroy a program that has reduced the number of uninsured Americans by around 16 million, lets families' policies cover children until age 26 and guarantees coverage for people with pre-existing illnesses. The overall Senate bill would effectively defang the health law's requirements for individual and employer-provided coverage by annulling the fines that enforce them. It would terminate the law's expansion of Medicaid to cover additional lower-earning people and the federal subsidies it offers people buying policies in insurance marketplaces. It would also annul tax increases imposed to cover the law's costs, including levies on the income of higher-earning people, medical devices, costly insurance policies and tanning salons.